Section C-2 is excited to announce the theme of our 2019 Conclave. 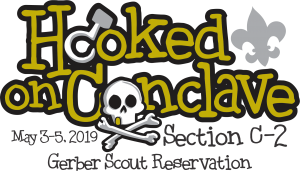 Pirates of the Great Lakes, grab your swords and parrots and your OA brothers at Gerber Scout Reservation, May 3-5, 2019. This will be an exciting weekend that is sure to bring new energy to all scouts who attend. This event will be unlike any event you have ever experienced and reinvigorate the principles of brotherhood, cheerfulness, and service in every Arrowman who attends. It will be a weekend full of trainings, competitions, games, entertainment, and fellowship with Arrowmen from the four lodges of the Lower Peninsula of Michigan. Mark your calendars, and get ready to be hooked on conclave.